This figure pack is definitely one of the harder to find is Series 1-2 and I suspect when retailers order these figures, they get multiple figure packs for some of the other Series 1-2 figures and only one of this one (which is common practice with toys). Fortunately, this figure pack has been restocked recently and so it is still possible to pick this up in stores. With the inclusion of a Koopaling, that immediately makes a rare figure pack that much more desirable, but let’s look at each figure and see if it lives up to its potential. 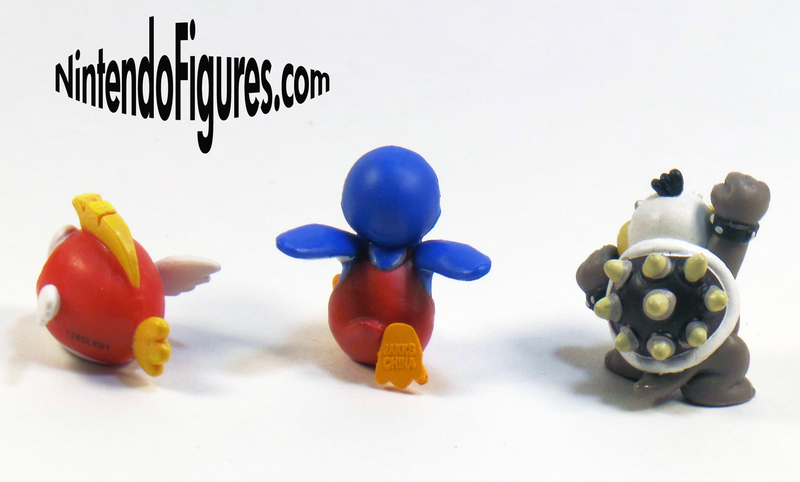 Cheep Cheep – This figure is surely inspired by the playsets that were released in Series 1-2 and Jakks rightly assumed that we would want a water-based enemy with the new water tiles. I’m happy to report that the Cheep Cheep in my pack is practically flawless. The eyes are centered and the paint is applied very well. There are no splotches or errors here. Cheep Cheep has the factory/production numbers on the back in a fairly hidden place and to be honest, I’m glad they put the numbers on him instead of Mario or Morton. All in all, I’m happy with this figure and think you can’t go wrong with having Cheep Cheep for a display. 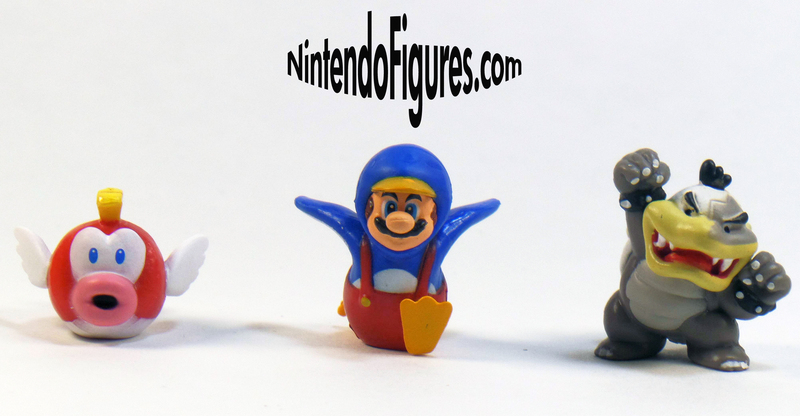 Penguin Mario – I have to give Jakks credit for making a Mario figure in a great action pose. Penguin Mario looks like he is running and/or sliding at full speed through a level. The pose does make him harder to stand up, but nowhere near how bad Toad or Boom Boom are. The only downside to the figure is that the lighter colors like the white on the under side of his flippers and the yellow bill of the Penguin Suit needed another coat of paint and didn’t get it. This is a problem with other Series 1-2 figures so it is not too surprising. Other than that, this is a great figure and one Micro Land fans will want even if they don’t have the ice level playsets (or maybe even more so if they don’t own any of those playsets since the same Penguin Mario figure also comes in one of the ice playsets). Morton Koopa – Saving the most interesting for last, Morton Koopa is a figure I wanted as soon as I saw what was coming out in Series 1-2. Nintendo fans just don’t have a lot of figures of the Koopalings and I’m happy to say Micro Land has really brought Morton to life. The pose perfectly captures Morton’s fierce nature. The paint job looks good and captures the unique and somewhat dull colors of Morton well too. The only areas that might be better are his toenails and a few small spots on the back of his shell which are hard to see even in the pictures I have taken. Of the three figures, Morton is not only my favorite, but is certainly one of the very best figures in Series 1-2. Closing Thoughts – While it is true that the figures in this pack don’t match that many of the tiles in Micro Land (especially Morton), I think this figure pack is highly sought after for good reason. 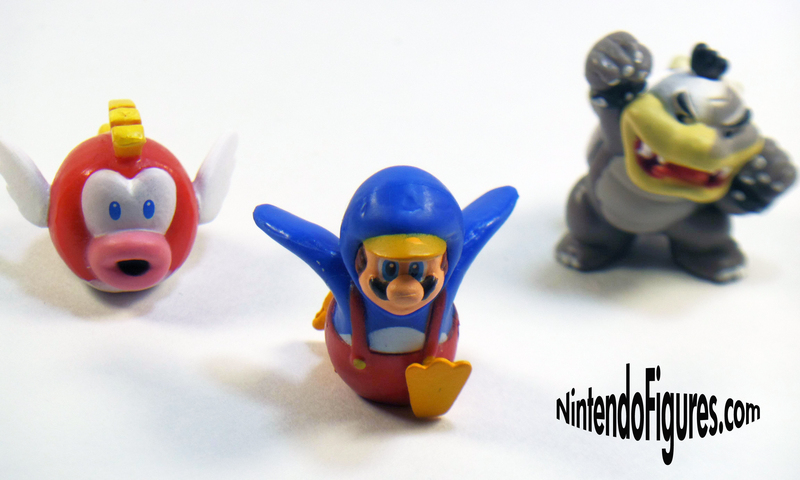 With high quality poses and above average paint jobs when compared to other figure packs from Series 1-2, what Nintendo fan wouldn’t want to own these? Previous Micro Land Zelda: Wind Waker Figure Packs Spotted!